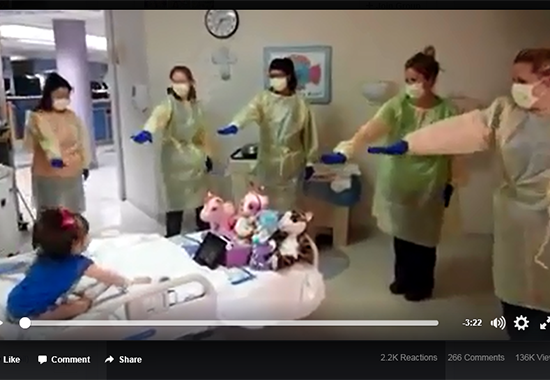 Video of Madison Austin’s Hokey Pokey party with her PICU nurses goes viral. A little fun can go a long way to brighten the day of a seriously ill child. Four-year-old Madison Austin’s pure delight to host a special Hokey Pokey Party with her nurses at HSHS St. John’s Children’s Hospital has taken the internet by storm and melted countless hearts worldwide. Madison was born with a rare birth defect called Neuronal Migration Disorder, which has caused low muscle tone in her body and narrowed airways in her lungs. She and her family receive support through the Home Care Program, operated by the University of Illinois at Chicago’s Division of Specialized Care for Children on behalf of the Illinois Department of Healthcare and Family Services. Madison has a tracheostomy tube and has required several hospitalizations at St. John’s in her short life. In February, she was admitted to the pediatric intensive care unit with breathing complications from the flu and other illnesses. To help lift her spirits, Madison’s nurses happily agreed to dance along to her favorite song, the Hokey Pokey. Her mother, Krista, posted a video of the dance party to her Facebook page. It soon went viral and has since appeared on numerous media outlets, including local newscasts across the country, the Today Show and ellenNation. The Hokey Pokey party became a daily occurrence for Madison and her nurses, and the Austin family expects to continue the dancing at home. We hope Madison’s star continues to shine brightly and spread joy to others!